Pedants, pay attention: we are getting precise down to the atom! Take a rock sample of only one billionth gramme, examine it with a so-called secondary ion mass spectrometer, short SIMS, and find one specific atom amongst ten million others. This is reality at the Helmholtz Centre Potsdam GFZ German Research Centre for Geosciences. 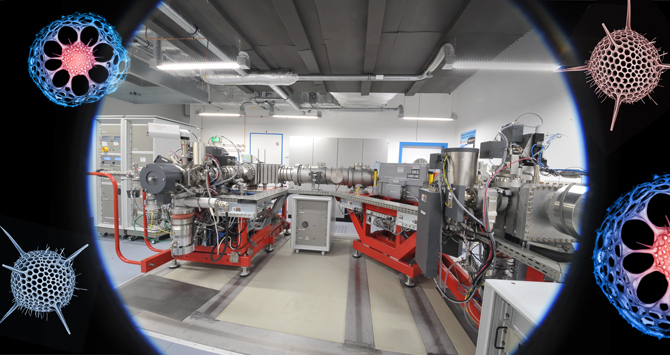 Scientists there target a rock sample with a focussed ion beam in ultra-high vacuum with a precision down to one micrometre. This results in the release of material, which partly ionises and subsequently is analysed in the mass spectrometer. At present, there are only five measuring sites in Europe for such extremely precise analyses, and Potsdam is the only one in Germany so far. Already, the SIMS technology is widely used: not only for finding rare raw materials, but also for researching the global climate. As regards subject matter, the booked project ideas range from the Earth's core to space. The GFZ has been operating a SIMS laboratory since 1998, where scientists from all across the globe examine their rock samples. More than 100 projects have already been processed with partners from 22 countries. The new SIMS, in operation since December 2013, now makes this not only faster, but even more precise. The device is about twenty times faster and five times more accurate than the predecessor model. Guest researchers from the Alfred Wegener Institute currently investigate oxygen isotopes in micro fossils at the GFZ's SIMS. Thanks to this new technology, these nanogramme lightweight protozoa with an opal skeleton now can tell us even more about the history of the oceans.